Commuting has always been a great way to get in miles when balancing the demands of work, life, and your athletic goals. Some of you are fortunate to have commutes that may give you an hour or more in a day, while many get in an hour at best in your daily commute. Naturally, the less time you get to spend on the bike, the more important the quality of those rides become. So, how can you add some purpose to those commutes and get every last little bit of value out of the time you are on the bike? When trying to build aerobic endurance, the go-to workout has always been a series of long endurance paced rides that target the aerobic system. While those long rides often yield the best results, the next best thing would be to add some tempo intervals into your weekday routine. Tempo intervals work the upper end of the aerobic system and lower end of glycolytic system (the primary system in use when above lactate threshold). So, you’re in essence stressing two important systems at one time with the aerobic system being stressed at the upper end of it’s capability. 1 x 10 minute at tempo (77 to 91 percent of threshold power or 86 to 94 percent of threshold HR) on your way to work and again on your way home. If you have a longer commute and aren’t ready for a longer tempo interval but 1 x 10 feels too easy: 2 x 10 minutes at tempo intervals (77 to 91 percent of threshold power or 86 to 94 percent of threshold HR) with 10 minutes recovery between intervals on your way to work and again on your way home. If you’re ready for some longer tempo intervals: 1 x 20 minute at tempo (77 to 91 percent of threshold power or 86 to 94 percent of threshold HR) on your way to work and again on your way home. Threshold work is paramount to having a strong ceiling for your fitness. Raising your lactate threshold, basically raises the capacity for you to do anything at threshold or below threshold. If you can fit in tempo intervals, you should have no problem working in some threshold intervals. In fact, you can use the same interval lengths you use for the above tempo intervals, but just increasing the intensity of those workouts to 92 to 115 percent of threshold power or 95 to 105 percent of threshold heart rate. Intervals targeting anaerobic capacity are often pretty short and violent bursts, which can be tricky to accomplish with a backpack on or when sporting a bike with panniers. However, this doesn’t mean that they can’t be done. One of my favorite workouts when it comes to anaerobic work is a series of 1 minute seated intervals pushing all out with equal recovery time between intervals. With these being seated, they won’t be as violent, with the limited recovery time, you’re physiological cost will increase with every interval since you’re not fully recovering, and with a whole minute at redline, you’ll be targeting your anaerobic capacity. Below are some examples of how you can structure these sort of workouts. 3 x 1 minute at anaerobic capacity (116 percent plus of threshold power or 106 percent plus of threshold heart rate) with 1 minute recovery between intervals. Repeat these on your way home. If 3 x 1 minute seems too easy, throw in a second set: 2 sets of 3 x 1 minute at anaerobic capacity (116 percent plus of threshold power or 106 percent plus of threshold heart rate) with 1 minute recovery between intervals and 10 minutes recovery between sets. Repeat these on your way home. If you’re wanting more back to back intervals, add more 1 minute intervals up to 10 x 1 minute intervals or even think about adding more intervals with sets. Even if you start at the bottom with 3 x 1’s, you’ll eventually need to be adding more as you adapt to the workload in the way of more intervals, sets, or both. The great thing about commuting is that you pretty much end up being a sort of pack mule with all your stuff either on your back, your bike, or a little of both. This adds resistance if going uphill and frontal area if fighting a headwind. That added resistance leaves plenty of room for neuromuscular work in the way of improving pedaling mechanics and muscle fiber recruitment. Neuromuscular workouts tend to be done at high resistance and in a low gear, turning a low cadence. These can go on for 2 to 10 minutes with the focus being on a smooth pedal stroke pulling through the bottom of the stroke and pushing over the top and through the pedal stroke. Once proper mechanics ceases due to muscular fatigue, these intervals can be stopped as the main purpose of these intervals is proper biomechanics and the muscle fiber recruitment to support those biomechanics. Once you feel comfortable with your pedaling mechanics, you can take the challenge to the next level by commuting on a fixie which gives you the resistance any time you hit a rise in the road or a headwind in addition to forcing you to spin efficiently on downhills and in tailwinds. Fixed gear riding can do wonders in improving pedaling mechanics and in turn make you vastly more efficient. 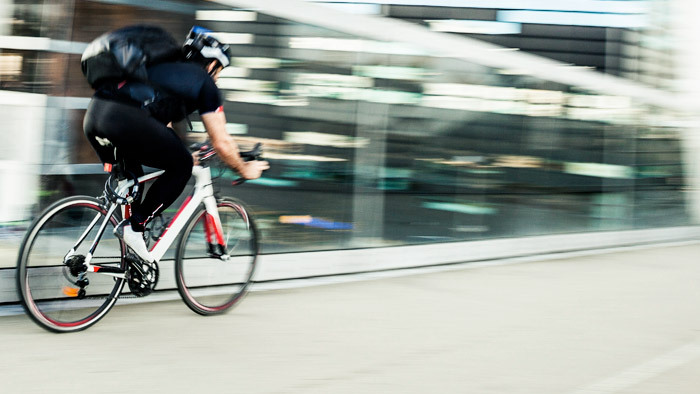 Commuting is a great way to work your training into your day to day routine. Adding specific workouts to your commute will take your commute to the next level and help you achieve that level of fitness you need to achieve your fitness goals.